Unfortunately, the issues with my newsletter subscription list at Yahoo have not yet been solved. Because of problems that AOL subscribers have receiving my notices, I have to maintain 4 separate Yahoo groups for the newsletters. The majority of the subscribers are in the first group. However, I had to set up 3 smaller ones (limited to 99 name each) for AOL folks and others who have problems getting my notices. (AOL is convinced I'm sending spam if the lists get any larger than 99 names.) The 3 smaller groups are still around, but it is the largest one that has around 1800 names that is missing. I will keep you posted as things develop. Please bear with me. As you can imagine this is a very busy time for me between Christmas and getting ready for the Nashville Tradeshow in February and teaching a new project for the first time in March. Below are photos of Dee's Flowers for Lily. 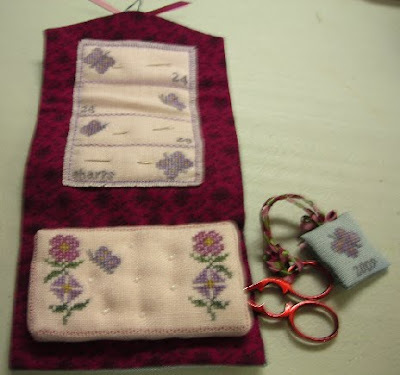 Don't you love the beads she added to the mattress pincushion shown in the second photo? And her lining fabric is quite striking. 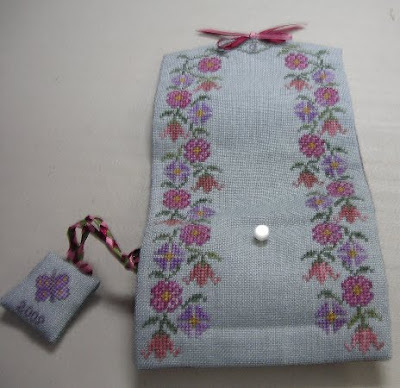 On a personal stitching note, I'm nearly done with Mary Busby, the 4th of my Ackworth gals. Earlier this week I went to see Carol, my framer friend, and picked up My Quaker Lady which she had framed. While there, Carol measured Mary for her frame. You may remember that my hope is to hang my 4 Ackworth gals over our bed. The other 3 gals are patiently awaiting for Mary to join them.